So after a couple of months of generally ignoring as much of the NFL as I could (I listen to about 20 hours of NFL podcasts a week during the season, and I could give a few great audiobook recommendations as they’ve been filling my ear-drums instead in recent weeks!) I’ve slowly been getting back into it recently and seeing if I can find anything I think is value in the draft markets. Unfortunately there’s not a whole lot of options about with only Paddypower and Skybet offering any variety on what we can get on. Before I get started on that, I will push the couple of UK based draft guides that I’ve been reading over the last few nights. Both offer good opinions, and while one is significantly more in-depth than the other, I find myself reading the shorter write-ups then using the more detailed guide for further analysis on players. And the more in-depth guide which I’ve purchased for a couple of years now has been put together by Matt Phillips, Mr. 40 yard Scouting on twitter (@mattphillips78) on twitter, and ukdraftguide.com on the web. It’s £5 to purchase, but that all goes to charity, which is always nice, and it has very in-depth, detailed, an example below of what you can expect on the top draft prospects, even players expected lower have a lot of detail, it’s something I highly recommend for anyone wanting to learn up on the prospects! I have posted a few on twitter over the last couple of weeks, the prices on them have generally gone, unfortunately it only takes a few bets to slash the prices on these as they’re such small books. Ones I posted on twitter – this one is more than likely dead now, and there’s far better odds these days, but after he blew away everyone at the combine immedicacy bias took over me and I put £20 on Saquon Barkley as #1 overall pick at 5/2. You can get far better than that now, 8/1 for him at Sky, 6 at PP. So that’s probably dead in the water. I did also manage to get on £30 on Sam Darnold at 7/4 as I still believe (despite the Josh Allen hype) that he’ll be the alternative, and the reading I’ve done backs that up, he seems to have the highest ceiling of any QB in this class) He’s now odds on, 4/5 at PP, 8/13 at Sky. None of the above help anyone looking at this right now, but had to mention them for honesty purposes, and I’ll record them on my P/L. I think there will be at least 5 QBs taken in the first round, I think that Darnold, Allen, Rosen, Mayfield and Jackson will be gone in the top 20 as I’m expecting at least one team to be trading up to get their hands on one of them in this strong class. I was ready and willing to lump on o4.5 QBs at 1/2 a week or so ago, but it seems that some other people had the same idea and that’s in to 2/7 now. While I think it will happen, I can’t be having that line. So I’ll move on from QBs and I may well lump on o1.5 RBs in the first round which is currently at 1/2. Barkley will be gone by pick 5. 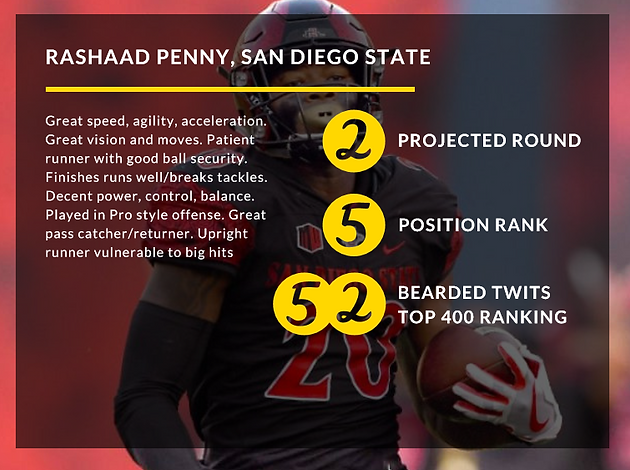 Then there’s the likes of Derrius Giuce, my boy Rashaad Penny and Sony Michel who are likely to be on the cusp of round 1 and 2. The draft analysts on NFL.com all have at least 2, with one of them with 3 being taken in round one. I’m tempted to have a dart at Penny as the first RB off the board without Barkley at 20/1 on PP. I know it’s very unlikely but a tiny stake may be risked on it from me. Number of WRs drafted in the first round is set at 2.5 with the odds leaning towards the under. I won’t be going near this one. I think it will probably be 2, Ridley and Courtland Sutton, DJ Moore is also getting hyped up recently. Ridley is favourite on Sky and PP, 1/2 and 8/13 respectively, Sky have the others at 3/1 while PP go 3/1 Moore and 7/1 on Sutton. It’s another i’d be tempted to have a dart at Sutton at the odds. It seems likely the Cardinals and the Cowboys will probably be after a WR. Cards are at pick 15, Cowgirls at 19. I think there’s probably a 50/50 chance that a tight end goes in the first round. There were 3 this time last year (which won us a decent amount) but because it’s quite heavy with talent in other areas that position will probably get overlooked this time around, Hayden Hurst seems to be the choice of the analysts I have read, he’s 6/4 to be the first tight end off the board. I would lean to at least one getting taken in the first, but at 8/11 it’s not one that I want to put anything on. Then there’s Dallas Goedert and Mike Gesicki, the second of whom posted some great numbers at the combine and got on a lot of radars. The Saints seem to be the team linked with a young TE. I’ll be keeping an eye on Skybet over the next week in the hope that there’s actually some value there, because frankly there’s not a lot to go on at the moment! All I can recommend for people to get on right now is o1.5 RBs at 1/2 (Skybet) but you’ll probably need a hefty stake to make it worthwhile. Paddypower already has odds available to make the playoffs, Sky have the division winners, the usual lot are there, and it’s tough to judge anything pre-draft but there were a few that I thought weird. The Rams have been doing all they can to mount a Superbowl run this year and the Seahawks and Cardinals are weaker than last year, they will probably be challenged for the division by the 49ers, who are the fashionable pick this year after winning every game when Jimmy G took over. The Rams are 1/2, 49ers 8/11, both are probably good bets. But for the Rams I would probably take the 6/5 available for them to win the NFC West instead of 1/2 for the playoffs. I wouldn’t go near the Cowboys to make the playoffs, or the Giants in that division. BUT the Redskins, for some reason are priced up at 9/1. That’s probably worth a punt as they haven’t lost a whole lot in signing Alex Smith over Kirk Cousins. 2 Other teams at 9/1 to make the playoffs are the Bengals and the Browns. Although I’m a fan, I honestly don’t think the Bengals are far away from getting second place in that division, and I definitely think they’re better placed than the Ravens who are at a measly 7/4 to make the playoffs. The Browns are the ultimate wildcard with so many picks and having made some good signings, they could be anything! I think the Chiefs are probably stronger than last year as well in the AFC West, I think that Paddy ‘Homes will have a great season and despite losing Marcus Peters they look good, it’s probably between them and the Chargers for the division, and both are priced at 8/11. – Scratch that, I think the Chiefs to win the division at 3/1 is a pretty good bet. I’ll wait until after the draft, and probably later in the off-season to get on these as there’s a lot that can go on, but I think there’s a few that are significantly over-priced at the moment. Saying that I do have a 6-fold on Division winners – Rams, Pats, Saints have all shortened, Chiefs have lengthened, it’s now at 97/1-ish. I had some spare cash in there so got on while I was thinking about it. As pointed out to me on twitter, it’s basically the same as last season! I prefer the Vikings over an odds-on Green Bay, the NFC South is still really tough to call so that one is definitely dodgy.